There’s a good chance you plan to read the bible more this year. As you planed last year. It’s a good resolution. God told Joshua that the path to prosperity and success includes daily study of God’s word. Someone wise said, “Those who fail to plan, plan to fail.” (It may have been Benjamin Franklin. Or Winston Churchill. Or somebody’s business prof.) You need a plan to move your intentions into actions. A bible reading plan can help you succeed in your intention to read the bible more this year. This plan from Biblica leads you through the big story the Bible is telling in about 60 days. This is a great plan for understanding how the different parts of scripture fit into the story of God’s plan for creation. The Book-at-a-Time Bible Reading Plan from Discipleship Journal guides you through the entire bible in one year. Need a plan that requires a smaller time commitment? This plan from Discipleship Journal helps you read the New Testament in 5 minutes a day, 5 days a week. Maybe you’re ready for a reading challenge. Perhaps you want to start 2016 with a bible reading boot camp. With this plan you can read the Bible cover to cover in 90 days. What’s your plan for Bible reading this year? May God’s word light every step of your path throughout the year! For week seven of the 52 Verses Challenge, we continue memorizing 1 Corinthians 13. It’s week 6 of the 52 Verses Challenge. Congratulations! This is our second week memorizing God’s plan for love from 1 Corinthians 13. Happy Valentines Day! It’s the beginning of February. Over the next two weeks we will be inundated with unhealthy messages about love. Valentine’s Day brings forth all of our false cultural notions of love. This is the perfect month to remember God’s design for love. For the next few weeks we will memorize God’s perfect description of love from 1 Corinthian’s 13. We begin this week with verse 4. Most of my family has been sick at some point during the last month. We’ve had the sickness that lingers with fever and cough, leaving you exhausted for weeks. Even those that avoided this round of illness are tired. This week for the 52 Verses Challenge we will memorize Jeremiah 17:14, a reminder that healing comes from God. This verse is set in a lament about the consequences of Judah’s sins. The nation had turned away from the Lord; now the people are instructed to write, in dramatic fashion, a list of their sins. This is to remind them of the serious consequences that come from trusting one’s own desires and turning away from the Lord. However, there is great blessing found in trusting the Lord and following His way. Jeremiah 17:14 reminds us that healing and salvation come when we turn from our selves and fully surrender to the Lord. Healing is much more than physical. It involves our bodies, and illness, but extends to God setting right everything that is broken in our lives – body, mind, and soul. for you are the one I praise. For week three of the 52 Verses Challenge we’re memorizing Joshua 1:9. I’m currently preaching a series on this amazing promise: God is always present with us. More and more, fear drives North American culture. People are becoming more discouraged. But this is not the dominate realty for Christians. The more aware of God’s presence we are the more peace and hope we can have in moments of difficulty. We can have strength and courage because God is present with us. Always. This week’s memory verse reminds us why we are undertaking the 52 Verses Challenge. We are joining the writer of Psalm 119 in hiding God’s word in our hearts so that we may not turn from God’s best plans for our life. God’s way leads us into the best life possible; we memorize scripture so that we may stay on this path. We always seem to be looking for a magic solution, that one trick that will let us rise above the difficulties and conquer all that life throws at us – while smiling the whole time. There are no magic solutions. But there are some core disciplines common among people who rock at life. For followers of Jesus, scripture memorization is one of these core disciplines. Psalm 119 is an extended meditation on the beauty of God’s law found in scripture. Following God’s way in the world, as revealed in the Bible, is the most sure path through life. It is the way to the best life possible. Memorizing Scripture allows us to carry God’s word with us at all times, allowing us to access God’s promises and guidance at just the moment we need them. The psalm writer has discovered that God’s word is the light that can guide surely along the path. Imagine having memorized scripture passages that can light your path in a moment of decision. God brings the right verse to mind at just the right time to help yo do just the right thing – because the verse is already placed in your memory. It’s like carrying a flashlight when you most need it. So that he might stay on the right path, following God’s will in all things, the psalm writer hides God’s word in his heart. What a great way to think about memorizing scripture: hiding God’s word in your heart! Want to become wise? Keep the commands of God with you at all times. Every night my family recites a memorized bible verse and prays together before our evening meal. In 2016 we intend to hide more of God’s Word in our hearts, memorizing 52 new Bible verses – one each week. We invite you to join us in the 52 Verse Bible Memory Challenge. Each week I’ll post our new memory verse on embracethegodlife.com so you can memorize it with us. For week one, let’s memorize Psalm 119:105: Your word is a lamp for my feet, a light on my path. Are you in? Let us know in the comments below. I was in an epic struggle. Despite years of time and effort I wasn’t sure I could finish the project. This wasn’t your everyday kind of project; this was a life goal, alter your destiny kind of project. And I was losing the battle. I had the skills necessary to accomplish what was in front of me, but I was paralyzed with an inability to do the work. During this season I read The War of Art by Steven Pressfield. I discovered names for my paralysis: fear and resistance. I was afraid that I didn’t have what it takes, that I wouldn’t be able to get the job done, that I would fail at a major life goal. So resistance took over, giving me all the reasons I would ever need to avoid instead of doing the work necessary. Pressfield named my struggle and help me understand that fear is not always a sign to stop or retreat, for fear can point the way to what we are most supposed to do. We overcome resistance by going pro – showing up and doing the work even when we’re afraid. I resisted resistance and fear, did the work, and accomplished my lifetime, destiny altering goal. Thank you, Steven. 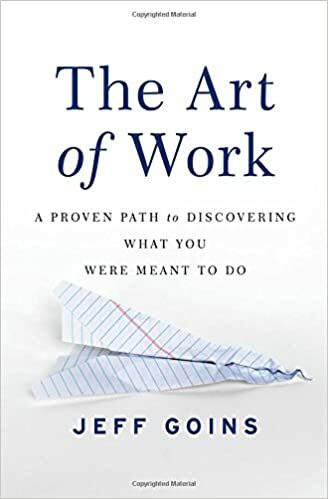 Recently, Mike at Speakeasy contacted me with an opportunity to receive a free review copy of Jeff Goin’s The Art of Work. I immediately noticed the homage to Pressfield’s work in the title. Seeing that Pressfield endorsed The Art of Work sealed the deal: Let’s see what Goins has to say. It turns out that calling is less about planning for the perfect life and more about responding well to the unexpected moments of life. I once thought that discovering my calling was something I would accomplish once and be done. It’s the “what will you be when you grow up” question. If this was the case, I would have settled this at 19. I’ve since made a discovery: we are never finished discovering our calling. Our calling becomes more specific as we walk the path it has for us. It manifests differently in different seasons of life. And, if we let it, calling will guide us throughout our life. Pressfield prepares us for the war involved in doing our most important work; Goins shows us the way to discover what that most important work is.